The Taguig Pateros District Hospital (TPDH) has become one of the few hospitals in the country to be given the recognition as a Mother-Baby Friendly Hospital by the Department of Health (DOH). Through the seal of recognition, this makes TPDH the 28th hospital in the country and the eighth local government unit (LGU) hospital to have received the prestigious recognition. 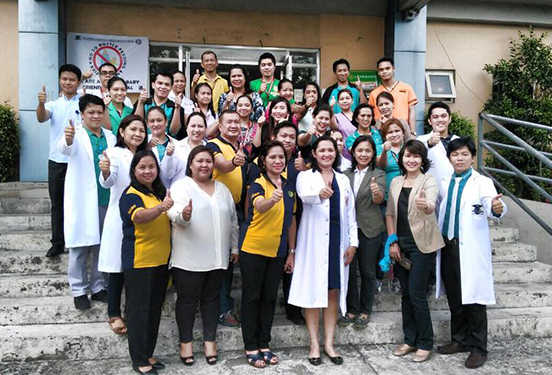 Mayor Lani Cayetano congratulated the men and women of TPDH, headed by Dr. Anna Richie Quilatan, for this latest achievement in the sector of providing quality health care in the City of Taguig. Mayor Lani added that the DOH recognition is a testament that the hardworking officials and staff of the hospital are serious in giving top-notch medical services to the constituents. “We are very proud of this achievement. The Mother-Baby Friendly Hospital accreditation simply means we are at par with the best hospitals in providing quality medical care to the public. All the support that the city has infused to the hospital has not gone to waste as we have proven that we can compete with the best and we can deliver true public service to the people of Taguig,” she said. The Mother-Baby Friendly Hospital Initiative (MBFHI) is a process aimed to promote breast feeding and in turn achieving Millennium Development Goal Program to reduce child mortality and improve maternal health. TPDH’s strong points, which paved the way to its accreditation as a Mother-Baby Friendly Hospital, include the hospital’s breast feeding policy, staff training on lactation management, strong link with the community to sustain breastfeeding, compliance with Executive Order 51 also known as the Milk Code and Republic Act 7600 or Rooming-In and Breastfeeding Act of 1992. Mayor Lani said she is committed to improve on the hospital’s maternal and infant care that is why a milk bank project is already in the pipeline to make this medical service a holistic approach to the people.